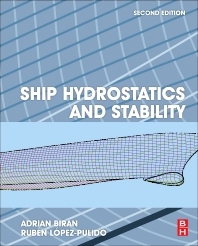 Ship Hydrostatics and Stability is a complete guide to understanding ship hydrostatics in ship design and ship performance, taking you from first principles through basic and applied theory to contemporary mathematical techniques for hydrostatic modeling and analysis. Real life examples of the practical application of hydrostatics are used to explain the theory and calculations using MATLAB and Excel. The new edition of this established resource takes in recent developments in naval architecture, such as parametric roll, the effects of non-linear motions on stability and the influence of ship lines, along with new international stability regulations. Extensive reference to computational techniques is made throughout and downloadable MATLAB files accompany the book to support your own hydrostatic and stability calculations. The book also includes definitions and indexes in French, German, Italian and Spanish to make the material as accessible as possible for international readers. Equips naval architects with the theory and context to understand and manage ship stability from the first stages of design through to construction and use. Covers the prerequisite foundational theory, including ship dimensions and geometry, numerical integration and the calculation of heeling and righting moments. Outlines a clear approach to stability modeling and analysis using computational methods, and covers the international standards and regulations that must be kept in mind throughout design work. Includes definitions and indexes in French, German, Italian and Spanish to make the material as accessible as possible for international readers. Naval architects involved in the design of ships and offshore structures; Students of naval architecture and marine engineering; Engineers, crew and officers managing stability aboard naval ships. Adrian Biran is Adjunct Associate Professor in the Faculty of Mechanical Engineering at Technion - Israel Institute of Technology. He has a Dipl. Ing. Degree from the Bucharest Polytechnic Institute and MSc and DSc degrees form the Technion. Adrian Biran worked as design engineer and project leader for IPRONAV in Bucharest, and Israel Shipyards and as research engineer in the Technion R&D Foundation in Haifa. Rubén López-Pulido, MSc, MPhil, CEng, MRINA, is an international maritime regulations expert and former Representative of Spain and technical advisor to the International Maritime Organization (IMO). He was Naval Architect at SENER and Stability of Ships Researcher at the CEHINAV (ETSIN-UPM) Madrid Ship Model Basin. Since 2012 he is Head of the Emergency Coordination and Crisis Management Unit for Transport and Infrastructures of the Spanish Government. MSc, MPhil, CEng, MRINA. Former Maritime Attaché of the Embassy of Spain in London and Representative of Spain to the International Maritime Organization. International maritime regulations expert.